In the first chart we can see that people spend most of their income (24%) on food. In some countries this percentage would obviously be much higher. Transport and then housing are the next major expenses at 18% and 12% respectively. Only 6% of income is spent on clothing. In the second chart entitled ‘World Population’, it is not surprising to find that 57% of people live in Asia. In fact China and India are two of the most populated countries in the world and they are both situated on this continent. Europe and the Americans account for nearly 30% of the total, whilst 10% of people live in Africa. 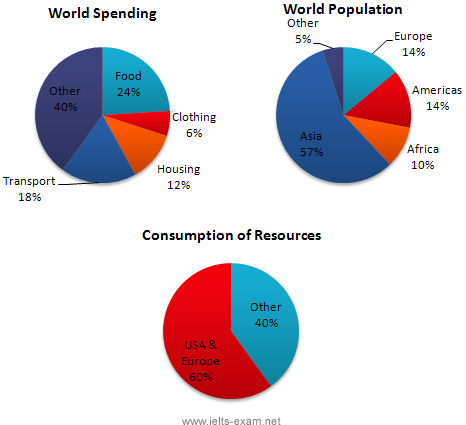 Finally, the third chart reveals that the USA and Europe consume a huge 60% of the world’s resource. To sum up, the major expenditure is on food, the population figures are the highest for Asia and the major consumers are the USA and Europe.